Build addition fluency and skills with our collection of addition worksheets and charts, fact practice pages, and word problems. Worksheets labeled with are Common Core Standards aligned and accessible to Pro subscribers only. Become a Subscriber to access all premium content. Don't see a printable you need? Use our Test Maker™ to create your own printable that fits your needs. Browse addition questions or use our advanced search to find existing questions while filtering by grade levels and keywords. 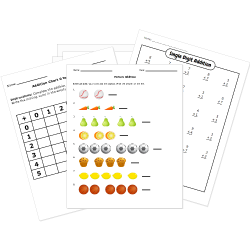 Quickly create free printable addition worksheets for drilling and practice with our Addition Worksheet Generator. Word Problem - Fluttering Butterflies! Word Problem - Growing Beans! Word Problem - Baking Pies! Word Problem - Let it Snow! Word Problem - Let's Play Soccer! Word Problem - Bike Riding! Word Problem - Rain, Rain, Go Away! Word Problem - Apple Picking! Word Problem - She Finds Sea Shells! Adding on a Ruler - Word Problems new!